Looking out over the Sounds. Benched tracks rule ok!! What a pleasure to walk with no mud and roots and to be able to look at the views. It was great to have Dee and Pippa with us for company - for their story - a 4 year voyage to New Zealand in a 31 foot yacht, and an interesting read go to: sula blog. 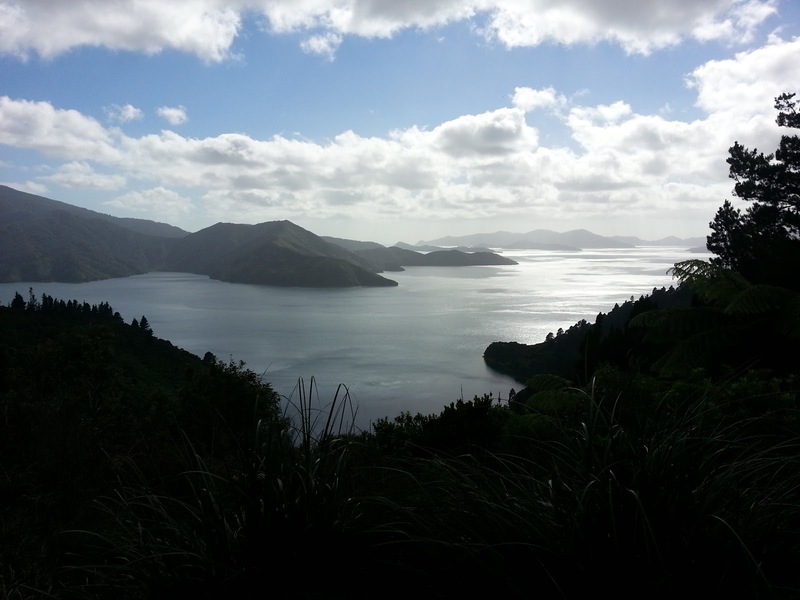 The Queen Charlotte Track is a 3-4 day walk in the Marlborough Sounds and a great introduction to multi-day tramping. A variety of accommodation options are available, you do not have to camp! Even better you can send your packs ahead on the water taxi - Luxury!!!! We are now basking in the sun in Havelock having done the link tracks and are poised to set off on the 9-10 day crossing of the Richmond Hills tomorrow. Our heaviest packs yet and hopefully enough food , just part of the Te Araroa weight loss programme!! You guys are doing an OUTSTANDING job! Well done - hope to see you when you are in Hanmer, always a cuppa out here at the camp for you both! !